Thanbyuzayat War Cemetery, Plot A3, Row C, Grave 20, Age 25. Victoria Point, Kendau 4.8km, Thetkaw, Khonkan, Augganaung. On 4th May 1942 the approximate number of 3,000 men in ‘A’ Force Burma embarked at Singapore on two ships. They were the first group of POWs to depart Singapore . ‘A’ Force was then split into three groups to work on airfield runway repairs at Victoria Point, Mergue and Tavoy prior to moving north to begin work on the Burma-Thailand rail link. Clarke was evacuated sick from Augganaung 105km Camp on 7.7.1943 to Khonkan 55k where he died on 13 August 1943 having suffered cardiac arrest following pellegra. 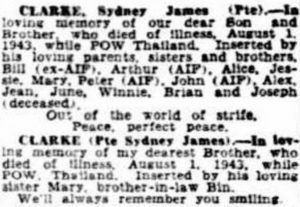 There is a possibility James Sydney Clarke who enlisted 10 August 1940 may well have changed his birth year from 1921 to 1918. 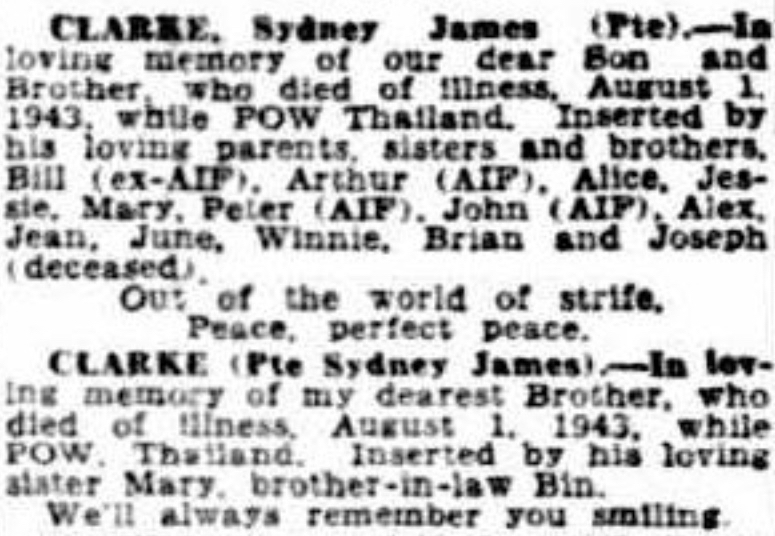 Death of his father May 1946.